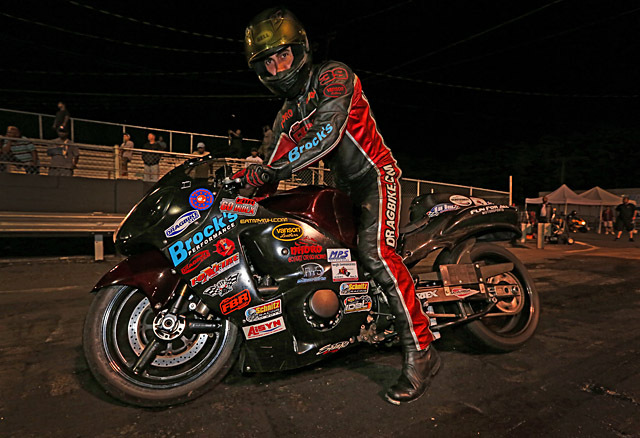 Motorcycle drag racing has evolved and changed considerably in the last decade and a half. Perhaps the most noticeable difference is the explosion of popularity in street bike drag racing. 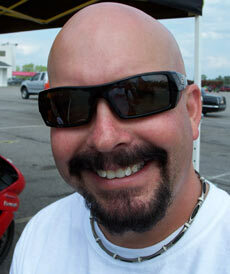 Owner of Brock’s Performance, Brock Davidson has long said the street machines are the future of drag racing. Time is proving the experienced racer, tuner and developer right. In the late 90s and early 2000s, ET lanes at dragbike races were filled with classic Kawasaki KZ and Suzuki GS-powered bikes. Dave Schnitz of Schnitz Racing said he would sell more than 100 KZ/Z head gaskets a year back then for even a 1075 c.c. motor; last year Schnitz says he sold one. 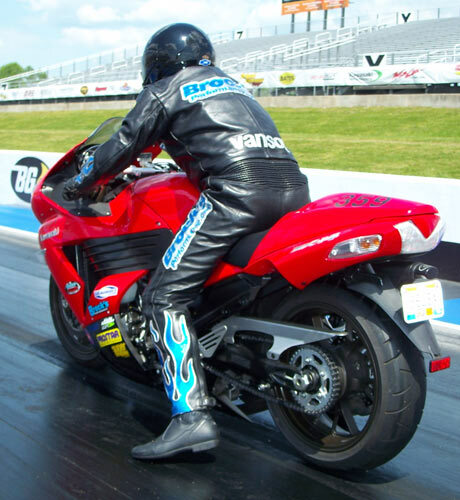 Meanwhile the powerful, advanced, and street-legal in many cases, Kawasaki ZX-14 and Suzuki Hayabusa and GSXR 1000, continue to become more popular among drag racers. Very few of these late-model weapons have wheelie-bars mounted to the rear of them. 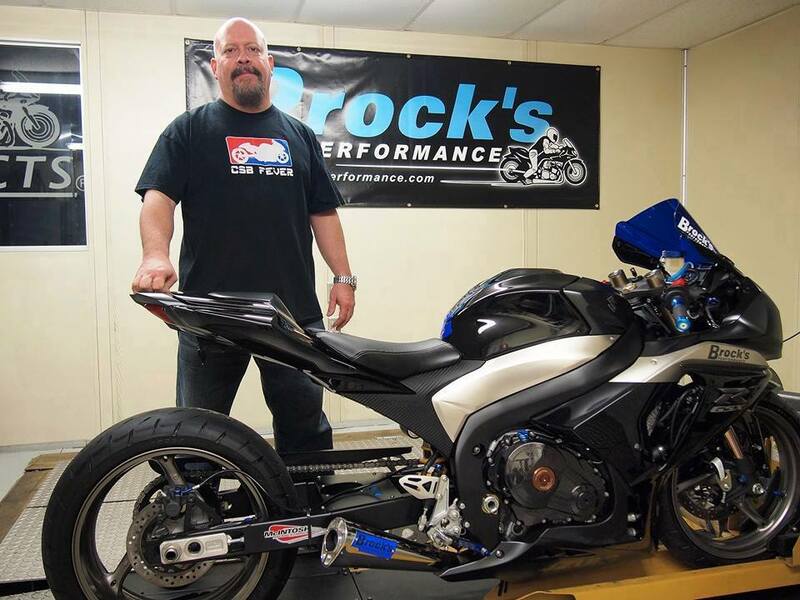 Brock Davidson has long said no-wheelie bar, sportbike drag racing is the future of the sport. Davidson’s love for the dual-purpose motorcycle began when he was 16 years old and sold his car so he could buy a Kawasaki H2 750. The two-stroke could get him to school during the week and to the winner’s circle on the weekend. In 1983 Davidson seriously began squeezing performance out of street legal motorcycles when he tuned his 1982 Suzuki Katana to a best ET of 9.03. 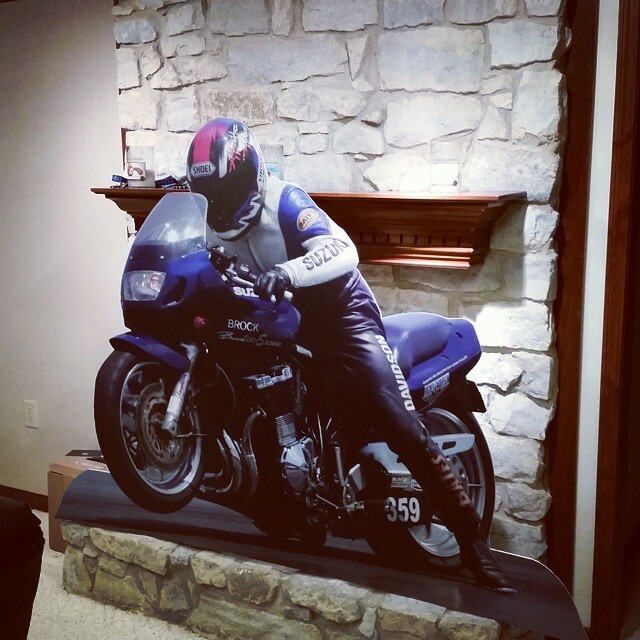 Brock Davidson’s fireplace insert is a vivid reminder of the history he made on his Suzuki Bandit, recording the first ever street-legal seven second run. Today racers are keeping their bikes street legal and most circuits are drawing far more street bikes than dragbikes, with sanctions offering more classes for the no-bar machines. The birth of the big-bore sportbike is largely responsible. Racers no longer have to sacrifice street-ability for seven-second performance. The ultra-powerful Hayabusa and ZX-14 are incredibly quick right from the factory and seem to be tailor-made for straight-line racing. Also in many cases it’s more affordable to get into drag racing with a street bike as opposed to a drag bike. Davidson competed in several non-street legal classes like Pro Comp, Pro Mod, Top Gas, even NHRA Pro Stock in 1992. Eventually he decided to quit wheelie bar racing because of the incredible amount of money he was spending tearing up parts while trying to keep up with the competition. 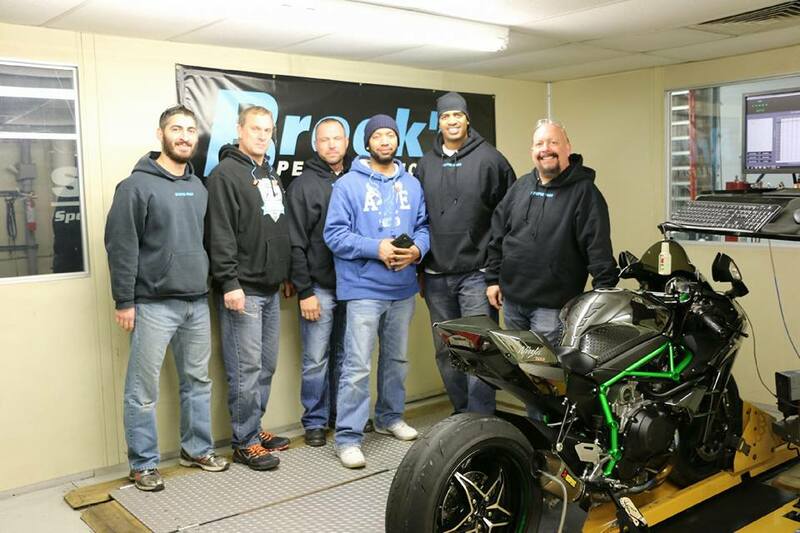 Davidson found street bike racing to be more about rider skill than money. “In no-bar racing if my opponent has a big pile of money but he can’t ride, I’m going to win,” Davidson said. Launching a 400-horsepower street bike provides Davidson with an incomparable thrill. It also requires a polished set of skills that can take years to perfect. 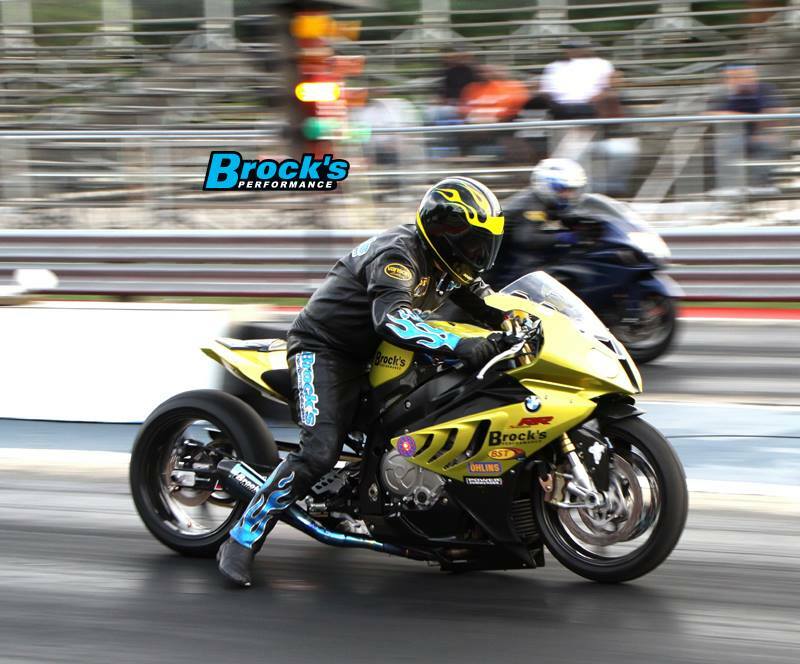 Brock Davidson even spent a lot of time fine-tuning the BMW sportbike for drag racing. So where is the sport headed in the future? Is leaving the wheelie bars at home the wave of the future or just a trend that will fade? Davidson predicts street bike interest will continue to grow in the dragbike racing world and most shops and engine builders will be forced to put a heavy emphasis on sport bike technology, if they have not already. 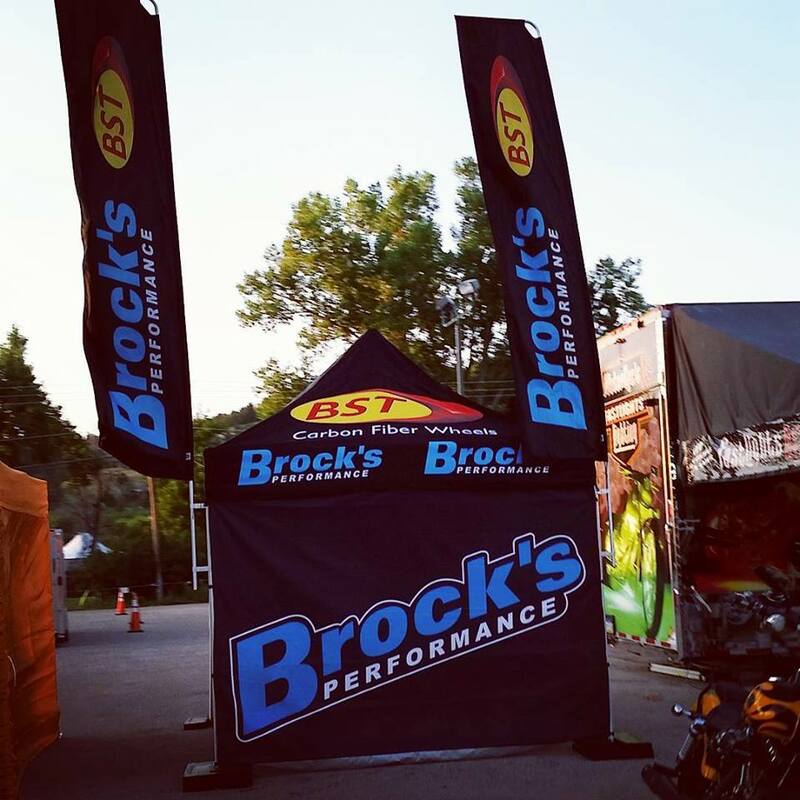 Brock’s Performance sets up displays at some of the biggest street bike rallies and races in the country. This new learning curve will no doubt continue to change the face of the sport. Instead of wrenches and screwdrivers, crew chiefs and tuners today come equipped with a laptop. “With some of the inexpensive self-tuning fuel injection units on the market today it’s like everyone has a dyno,” Davidson said. The computer has become this generation’s most valuable tool. ”Hell, I can’t remember the last time I had to get fuel on my hands to change my jetting,” Davidson said with a smile. Click on the banners below to see all the amazing deals at Brock’s this winter. There are lot of them! Don’t miss out. Thanks a lot. This has been special seeing. I would like to purchase a set of wheele bars for my 2017 Harley-Davidson tri-glide. Do you sell them or know where I can purchase a set?